Nearly ten years ago when I started The Evening Class, I was being influenced by my first exposure to national cinema(s) from the Global South, notably Africa, and specifically the work of Ousmane Sembène. I was reading everything I could get my hands on about the "Father of African Cinema" and stumbled across a quote of his that inspired the title for my site: "Cinema is the evening class for discriminating adults", which spoke to my own dream that the art of cinema might be strengthened by sociopolitical impulses towards cultural change. My cinephilia has morphed considerably in this past decade but my love for Sembène's work has remained steadfast and, thus, I was delighted to catch the screening of Samba Gadjigo and Jason Silverman's welcome documentary portrait Sembène! (2014) [official site] at the 38th edition of the Mill Valley Film Festival (MVFF). Sembène! will open theatrically in mid-November. As synopsized by MVFF programmer Zoë Elton: "One of the 20th century's most inspired storytellers, Ousmane Sembène's (Moolaade, MVFF 2004) own life story is itself extraordinary. A fifth-grade dropout from Senegal, as a young man he went to Marseille where working as a dockworker politicized and inspired him. Returning home, his dream of becoming the storyteller for a new Africa led him first to novels, then to film—despite the complete lack of infrastructure to support filmmaking. Known as the father of African film, his debut feature Black Girl (MVFF 2015) remains a classic of 20th-century cinema. 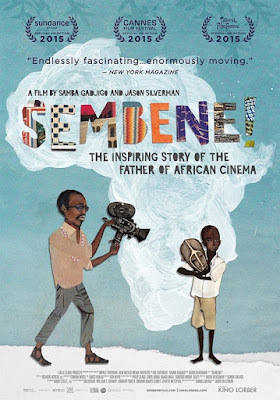 Longtime biographer and colleague Samba Gadjido collaborates with filmmaker Jason Silverman to tell Sembène's story: It's a portrait of a hero, a man of fearless vision who spoke up for the marginalized, and who laid the foundation for a vibrant cinema culture in West Africa. Through archival footage and a wealth of interviews—some surprisingly candid—Sembène! is rich and moving, a compelling tribute to his genius." Several visual layers texture Gadjigo and Silverman's complex portrait, and I'm grateful to have had an opportunity to enquire about at least one. Michael Guillén: Thank you so much for this remarkable portrait of one of my intellectual mentors. I was intrigued by the layering of the graphic guidance of your interstitial chapter headings. Can you speak a bit about the artists who did this for you and how you folded their collage-like designs into your overall project? Jason Silverman: Before Samba Gadjido became our first-person narrator, there was a fictional animated character who was going to tell the story, which I will tell you—as an independent documentary filmmaker with no money—is a bad idea. We took animators Edwina White and James Dunlap and a whole stop-action rig to Dakar, Senegal and we started buying all kinds of materials to turn into these 2-D puppets that we were going to use and animate. We actually made some really beautiful things; but, there was no way we were going to be able to tell the story that way. James and Edwina stuck with us through the whole project, even though at various points there was no animation in the film. We re-cut the film several times, but, in its last iteration, I pulled out every piece of graphic reference over our six years of image collecting and printed them out—there were a few hundred—to talk with the editor (Ricardo Acosta). We filtered through them and pulled out what we liked and worked on the structure of the film that way. These pieces of graphics by Edwina and James kept rising to the top. We knew they had a meaning and a place in the film but we didn't know where, but finally decided that they would be at the front of each chapter. All of the materials, the pallet, pieces of magazines and fabrics, that's Dakar [Sembène's home in his final years]. Although the final work wasn't done in Dakar, we workshopped it in Dakar. We hope we have that sense of authenticity. We actually left the entire animation rig at a cultural center there. We held an animation workshop with interns—we're still in contact with some of the artists we worked with—so hopefully there's people making animations in Dakar now.